More than a hundred extraordinary portraitslush, rich, textured, sculpturalthat reveal the spirit and nobility of the horse. Portraits of horses gazing at the camera, standing in the golden light, stamping away flies, galloping, bucking, rolling in the dust. Eastman has caught the animals complexity and power, fear and courage, goodness, masculinity, femininity, uniqueness. More than a hundred extraordinary portraits--lush, rich, textured, sculptural--that reveal the spirit and nobility of the horse. Portraits of horses gazing at the camera, standing in the golden light, stamping away flies, galloping, bucking, rolling in the dust. Eastman has caught the animal's complexity and power, fear and courage, goodness, masculinity, femininity, uniqueness. 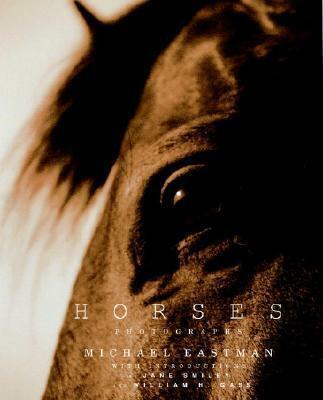 "All animals are wonderful," says Eastman, "but horses are truly mythic." Michael Eastman's photographs have appeared on the cover of "Time, " and his work has been published in "Life" and the "New York Times." Eastman is a recipient of a grant from the National Endowment for the Arts. He lives in St. Louis, Missouri.